Food Costs > How Much Do Oysters Cost? How Much Do Oysters Cost? Oysters are found in oceans around the world, usually in shallow waters or reefs. The shells, usually pear or oval in shape, can differ depending on what the oyster adheres to. The color of the shell on the outside is usually a shade of gray, while the inside is known to be pearly white. The costs of oysters will depend on the size of the oyster, how you’re purchasing them, where you live, market conditions and who you’re purchasing them from. Shucked oyster meats, often found in one-pound containers, can cost $8 to $12 per pound. Live oysters, depending on the size, can cost anywhere from $7 to $13 per dozen or $0.75 to $2 each. If the oysters are already prepared on the half shell, then the costs could be double the price. 100 count bushels can cost $55 to $65, and again, if prepped, the costs can be twice this amount. On Amazon.com, for instance, the highest rated seafood oysters retail for $60 to $100 for a 50-count box, depending on the season. At Silver Point Oysters, they list the average prices for shucked oyster meat and live Pacific oysters. The shucked oyster meat, depending on the container size, ranges from $8.50 for a pint to as much as $43 for a half gallon. As for the live Pacific oysters, the prices range from $7.50 to $9.15 per dozen. In the oyster world, there are only five species: the Atlantic, Pacific, Kumamoto, Olympias and Belons. A three-ounce serving of raw Eastern oysters has 45 calories and a week’s worth of your daily zinc requirement, according to SeriousEats.com. Fresh oysters are sold via three ways: either shell stock, shucked or HPP. Shell stock oysters are complete oysters suited for half-shell consumption and will often sit alive inside a case. These oysters are often sold on a “per oyster” basis. 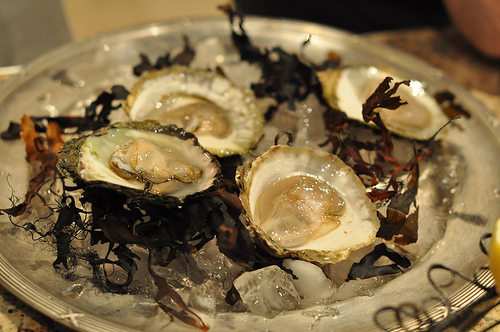 In the United States, you can find two varieties: the Eastern oyster or Pacific oyster. Shucked oysters are also considered fresh and a very convenient choice since you don’t have to fuss with opening them upon purchasing. The meat has already been removed, a process referred to as shucking, and the meat will then be rinsed with chilled water, often sold by the pint or in gallon sized jars. If you plan on buying oysters in the shell, a good oyster knife is highly recommended to making preparing much easier. A good knife can cost $10. Online purchases often incur additional shipping charges due to the sensitivity of the shipment. Depending on the amount purchased, this can range from $10 to $30 or sometimes waived if you spend enough. Throw away any oysters that have broken shells since foreign substances can find its way in. It’s not worth the risk. It is always advised to buy live oysters and eat them within 24 hours. To check for dead oysters, look for the ones with the shell slightly open and feel lighter compared to the live ones. If there is an oyster with an open shell, tap it lightly and it should close. If it does not, it is suggested that you throw the oyster away. Do not try to store them in the freezer as they can spoil and kill them quickly. Always refrigerate them for no more than two days, but if possible, try to receive them a day before you plan on shucking them. When refrigerating, however, place them in an open container and cover them a wet paper towel to prevent them from drying out. If purchasing shucked oysters, the liquid substance inside the container makes for a great cooking stock. Known as the nectar, this liquid constitutes of a milky looking oyster blood. While it’s perfectly fine to eat oysters any time of the year, many advocates state you shouldn’t eat during any month with the letter “r” in it. Yes, it’s safe to eat during these months; however, the temperatures in some waters can be too high, often affecting the taste. Oyster season is best during the colder months, from September to April. An oyster taste has a hint of the ocean, minus the salt, mixed with a white part of an overcooked egg. Some may call it gooey, while others may say it’s mushy, but regardless, it’s almost like a jelly-like resistance. If you live near the coastal waters where oysters are aplenty, many recommend checking out international markets for the best value. Don’t be afraid of cheap oyster offers at some restaurants or stores throughout the year as this doesn’t necessarily affect the quality. During some months, oysters are significantly cheaper due to the harvesting time. For example, on the east coast during the winter months, you may find the best deals. In the oyster world, the more you purchase at once, the more you can often save.